A king-size mattress with 1000 pocket springs for an independent supporting action, this Posture Pocket Plus range mattress also has a high grade high density foam box so that support is from edge to edge across the mattress surface. With 30mm of memory foam to top it, the 275mm mattress provides a comfortable rest through the night. 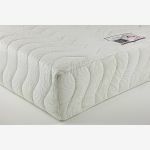 The luxury quilted cover allows heat to dissipate, as well giving a soft outer layer. This mattress is also available in a Supportive version for those looking for a more gentle sleep. Browse our bed frames – there are over 20 styles available – all with matching pieces to put together a comfortable haven in your bedroom.